You may have noticed how printer companies are only too happy to sell printers at or below the manufacturing cost, knowing that they are going to more than make up for it by selling you replacement printer cartridges for the life of the printer. Believe it or not, ink and toner sales worldwide total $100 billion per year. The vast majority of us don't think to ask the salesman two key things when we are purchasing a printer. The first of which is 'how many pages will the ink cartridge print' and the second one is 'how much does it cost to replace the cartridge?'. Many people do not know that it is possible for a new set of cartridges to cost you up to $180, which is nearly the cost of some inkjet printers! An even more annoying fact is that a large majority of your ink never actually gets used but it actually gets sprayed out onto the wastepad during auto maintenance cleans to make sure the print head doesnt clog. It is actually cheaper to leave your printer turned ON as it will reduce the amount of ink used. 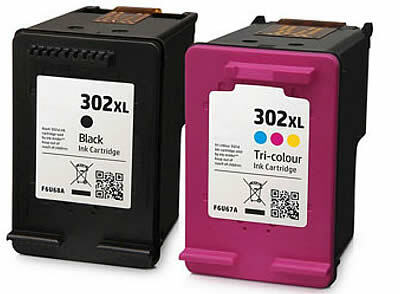 The high replacement cost of ink cartridges has created a huge demand for low cost compatible ink cartridges. There are now a number of alternatives to purchasing new cartridges from the printer manufacturer. One way that a large number of people are managing to avoid the high cost of replacement cartridges is by refilling their ink cartridges at home. There are quite a number of refill kits available that contain the ink you require, in addition to an ink syringe for completing the refill. While you can save a great deal of money this way, it can be a very messy procedure and nowadays due to the very competetive prices of Generic inks not many people attempt doing refills. These are typically the type of cartridge which has a built in print head. Due to the complicated structure of these cartridges it is far cheaper to remanufacture these than to create a whole new cartridge from scratch. A remanufactured cartridge simply means it has been reconditioned. This procedure usually involves the cartridge being flushed out, the sponge being replaced, the ink tank being refilled and finally being tested for print quality. While this procedure works be warned as the variation in quality from manufacturer to manufacturer varies immensely. At Ink Hub we dealt in remanufactured inks in the early days and many of the cartridges worked perfectly. What we did find however was that the failure rate for these was far greater than that of a well made, new compatible printer cartridge. This is to be expected I guess when comparing any"reconditioned" product to a brand new, mass produced item. It is a common procedure for Laser Toners to be remanufactured also. Toners tend to be more reliable however as they are physically larger and many of the parts are actually replaced by new ones during the remanufacturing process. Many people actually prefer a remanufactured toner over a compatible one as they are getting a "Genuine Brand Name" toner which has been fully rebuilt. As with any of the "refurbished" products be sure to purchase them from a reputable supplier who has good online reviews and is backed up by a proper warranty. The compatible ink cartridge is by far the most common of the "Generic" or non genuine type of cartridges. They are mass produced by the millions and for this reason they are very affordable in comparison to the "Brand Name" equivelant. Most of the Generic inks sold by reputable retailers are of a very high quality and they represent a huge saving over the genuine products. Typically savings can be in the range of 50 - 150% compared to equivalent "Brand Name" products. One of the most critical aspects of generic printer ink is it's ability to not dry on the surface of the printhead. Many of the compatible cartridges on the market these days are still not correctly formulated and often the residual ink that is left on the printhead surface dries too fast and the result is a blocked printhead resulting in poor quality printouts. A good quality generic ink will dry as soon as it hits the paper but not on the surface of the printhead. This may seem odd however the amount of ink actually sprayed onto the paper is minimal compared to the amount of ink that is present within the actual printhead itself. Believe me we have done extensive tests on our generic inks to make sure that they do not dry up or congeal unless they are actually on the printed paper. This is perhaps the most important aspect of a non genuine ink cartridge and it all revolves around getting the chemical formula in the inks correct so that the printed image looks great but the inks do not dry up on or in the printhead itself. Refillable cartridges are the same as a generic cartridge however they usually have a small opening at the very top to allow them to easily be refilled with ink when they require it. They also have either a resettable microchip or else an auto reset chip. The auto reset chip resets itself whenever the cartridge is removed and then replaced again. A resettable chip usually requires a device known as a chip re-setter which attaches to the chip and reprograms it to it's correct settings before being re-installed. A CISS or Continuous Ink Supply System is usually a complete set of cartridges with tubes coming off of them at the top. Each tube runs back to a large ink storage tank which is filled with ink as required. 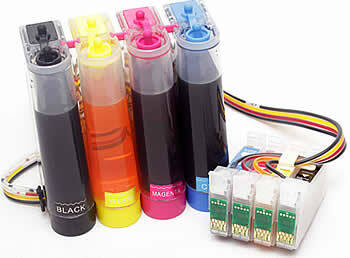 The ink storage tanks are externally mounted to the printer and the ink is drawn into the cartridges through the tubes. CISS have been around for many years and although they work they are often quite troublesome. Often sediment forms in the storage tanks as the ink dyes and pigments separate from the other chemicals and this sediment can end up flowing through to the printhead and clogging up the microscopic nozzles which spit out the ink. This problem can be eliminated to some extent if the ink in the tanks is lightly stirred every so often however caution must be taken to not stir hard enough to aerate the ink as this can also clog the fine nozzles. While refillable cartridges can be very cost saving and work well if a very high quality ink is used the CISS on the other hand I don't like at all. They seem to have too many issues with them and over the years they have proved to be more of a problem than they are worth. Also it should be noted that almost all microchips have a limited lifespan and may have to be replaced after so many re-sets. Genuine cartridges are made by the same companies which make the printers. The term OEM simply stands for Original Equipment Manufacturer so a Brother OEM is made by the Brother printer company and so on. There are several differences in the OEM product such as the aesthetics of the actual cartridge and packaging are far more impressive and often the ink is their own special formula. This in no way indicates that the genuine product is superior however it often convinces the consumer that anything other than the OEM is second rate or may damage the printer. As I've stated many times in the past this is certainly not the case and as time progresses generic consumables are becoming very close if not identical in quality to the brand name products. Some of the familiar trademark names of various inks include Brother's "Innobella" ink formula, Canon's "Chromalife" and Epson's "DURABRite". All certainly very impressive names and prices to match. Fortunately the generic printer cartridge market is gaining huge market share as consumers search for ways to save a few dollars and make their budgets stretch further. There has also been a huge move towards compatible toners as these have also become so much more reliable and represent a huge cost saving compared to their OEM equivalents. To sum this up it is basically saying that a warranty cannot be made void by the use of a third party product being used in it. Most companies if approached on this matter will usually honor their warranties unless in the case where very poorly constructed non genuine inks were found to have caused some issue. As stated before if you buy from a reputable retailer you will never have to worry about issues like this. What are the most Common types of Printer Ink? The most common type of printer ink which is typically used in the everyday inkjet printer is the UV curing ink. It comes in various formulas with the most common being an oil based ink which is used in the manufacture of OEM cartridges. The oil based ink uses both dyes and pigments to obtain the required colours and print quality as well as to provide longevity of print quality especially when exposed to UV rays. Most printers use dyes to achieve the various colours required for high grade prints. Canon generally use a combination of cartridges which use both dyes and pigments, hence the two black cartridges often seen in Canon printers. The large black is usually pigment based which gives a "blacker", sharper text printout. The remaining cartridges are dye based which provide vibrant colours when printing images and photos. Some of the latest Canon printers such as the "Maxify" range use pigment based inks in both the black and colour cartridges. This is designed to give optimal printouts with the Maxify printers and also pigment based inks are more fade resistant to UV and also more waterproof. The next type of printer ink is known as "Sublimation ink". The main use for sublimation ink is for printing on fabrics and hard coated surfaces such as ceramic mugs and tiles, plates etc. As long as the material is Polyester based then the ink will work fine. One of the most common uses for Sublimation ink is in the printing of T-shirts. One of the most common inks used extensively in the fashion industry is what's known as Water Based Reactive Dye. It is used to print the vibrant colours on most modern dresses and clothing. This type of ink is specially formulated to dry fast and to be very durable and hard wearing as you would expect it to be with clothing products. Although there are dozens of ink formulas perhaps the most common of all is the Water Based Dye Inks. This ink is used in almost all of the generic printer cartridges that are on the market today. They produce extremely vibrant colours and the overall print quality is equal to the more expensive OEM or genuine brand name inks. The only significant difference is that the water based ink is not quite as resilient to UV rays. Generally this is not an issue to most consumers as the price savings are significant and only printouts which are exposed to sunlight for long periods of time will be affected. Take a look at this article for a comprehensive overview on the various printer inks. Even though printer ink manufacturers will always try and convince you that you have to use their replacement cartridges, independent experts say that is not the case. For the vast majority of uses, low cost ink will work just as well as the ink in the much more expensive branded cartridges like those created by Hewlett Packard, Epson, OKI and Canon. Remember however that when purchasing Compatible Ink Cartridges / toner buy from a reputable dealer. Over the years comptible Ink Cartridges have been given a bad name and rightly so. There are still huge numbers of retailers both online and in stores who are selling cheap, inferior printer cartridges. A good quality compatible cartridge usually contains high quality USA printer ink. This will ensure that your printer runs trouble free and that your valuable printhead will not be blocked or clogged as can happen with low grade compatible cartridges. Also many of the inferior compatible ink cartridges are poorly moulded resulting in a cartridge which doesnt fit snuggly into the printer the same way as the original cartridge would. This can lead to compatibility issues due to microchips not contacting the printer terminals correctly etc. Compatible Printer Ink is definitely the way to go if you want to save money but be warned - There is a lot of rubbish out there! Make sure that you buy your printer ink from a reputable dealer who offers a money back guarantee and who will be there for you should a problem occur. Have a read here For more great articles on Printer Ink and related info. Compare our prices to Officeworks ! The Printer consumables industry has become incredibly competitive over the past 10 years or so, especially online. To survive the fierce competition online the retailers need to be very savvy about the design and usability of their websites as well as the SEO side of things. Many of the old school "bricks and mortar” stores such as Cartridge World have taken a battering from this fierce competition. This has resulted in many consumers going online to find cheaper prices, especially as the economy slows down and money becomes tighter. The likes of Cartridge World and such cannot compete price wise with the dozens of online stores which in comparison have much lower operating costs and overheads. This has resulted in many of the Cartridge World stores closing down or else moving to locations with less competition. Also most of the large wholesalers in Australia have had to diversify into other areas to remain viable. These large printer cartridge wholesalers who were once very profitable have now branched out into office furniture, computer hardware and also audio visual products. Even many of the large Chinese manufacturers of generic cartridges have slowed due to a worsening economy and also due to the more recent trade tariffs introduced recently in the USA. Printer manufacturers also have worked hard to try and slow the spread of generic cartridges by producing printers with refillable tanks or else very complex firmware designed to combat non genuine printer consumables. Annoying as it is I guess you cant blame them for trying to protect their market share however it can be very frustrating for the retailer and end user. With the development of non ink printers which use water and ink impregnated paper you've got to wonder where it's all going to end. Personally I think that the same technology will remain while there is big money to be made. I guess it's like the old scenario with cars and petrol, as long as there's money to be made not much will change.